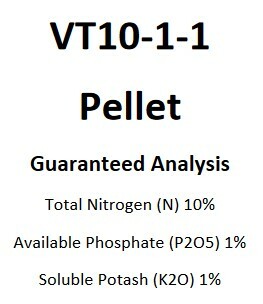 A blend of poultry feather meal and composted chicken manure with a guaranteed analysis of 10-1-1 (NPK). This is a pelleted product with many additional essential mineral nutrients plus soil building carbon. A need for balanced fertility with additional nitrogen, enhanced microbial diversity and support, and soil carbon. 3-3-3, 6-2-2, 8-1-1, and 10-1-1 formulations are available from this manufacturer. The chicken manure in these products is composted rather than pasteurized. Feather Meal is an additional component in the higher nitrogen blends.